This is a great shooting game in which you will have to become the biggest cluster of bubbles. The way you will do this is by shooting down the other ones and break them down to collectible bubbles. Move from one huge bubble to another once you clear it of the small ones and be careful not to get shot or you will break down fast as well. Try to dodge all the attacks and also do not collide with the bigger ones or they will surely tear you apart. Aim your shots carefully and spam them as much as you want because your ammo is unlimited. Use WASD to move and the mouse to aim and shoot. 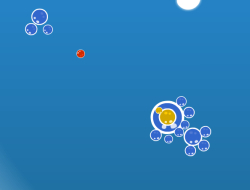 Bubble Tanks 0.00 between 0 and 10 based on 0 votes.